Carolyn Knits: "On the Bright Side"
The winter solstice occurred on December 21 in the Northern Hemisphere. With the Earth’s North Pole at its maximum tilt away from the sun, locations north of the equator saw the sun follow its lowest and shortest arc across the southern sky. The good news is that for the next six months, our days will grow longer as the sun spends more and more time above the horizon. Even though it has been ridiculously cold here, I am very glad to be on the brighter side of winter. I have some belated "Bright Side" stories from that solstice day. It was a Saturday afternoon, and I went to my LYS, Gosh Yarn It!, for a holiday "Stitch-N-Spin". There was a woman, who I will call C, sitting to my left, who I had just met for the first time. I learned that C was a friend of the shop owner, Jill, and that she was an on-again / off-again kind of knitter. When I sat down to join the group, C was happily knitting away on a garter stitch afghan for her son. Next comes a sad part of the story... C found a hole in her approximately 3-4 feet of afghan. Then she found another. And everyone was concerned and trying to decide if it could be repaired. In short time, it was concluded that a mouse might have done it. There was a small hole on a bottom edge of her laminated burlap bag. I was consulted (I do teach there) and I suggested that the one hole seemed like a slit and might be repaired by placing each side (4-5 stitches) on a dpn and working a Kitchener stitch to graft it closed. I said that I thought it best to rip back to the other, more irregular hole, because it would only be a few inches of lost knitting. The get-together ended all too quickly (4:00 PM). Many of us (including me) were happy to have had a lovely break from our own holiday preparations. I never knew I loved mulled cider until I tasted Ann's. A student of mine, who I had not seen in ages, told me that she enjoys reading this blog. I left the shop with a happy heart. ALSO ON THE BRIGHT SIDE: A day or two before the solstice, I found something that I had lost. 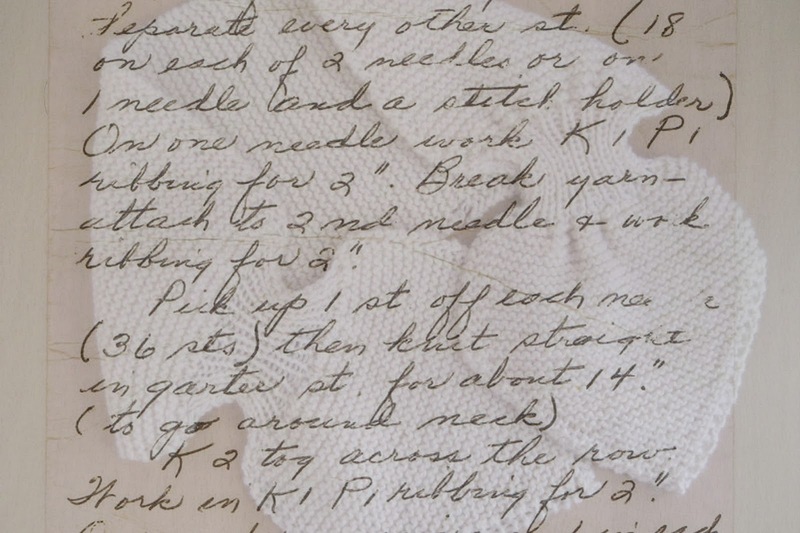 I mentioned in a post in October that "I found my mother's (handwritten) directions (for an old little neck scarf) on a small piece of paper when I went through some of her knitting things." What I did not mention was that I had the idea to include that small piece of paper in the photo of the scarf, but I could not find it. I happily re-found my Mom's pattern during the search for a hat pattern that I mentioned in this more recent December post. A "multiple exposure" collage created in Picasa3. I'm pretty sure I remember the sun being very bright on that solstice day. One day this week was the first day of the year 2014 that the sun set after 5:00 PM local time. That makes me very happy. 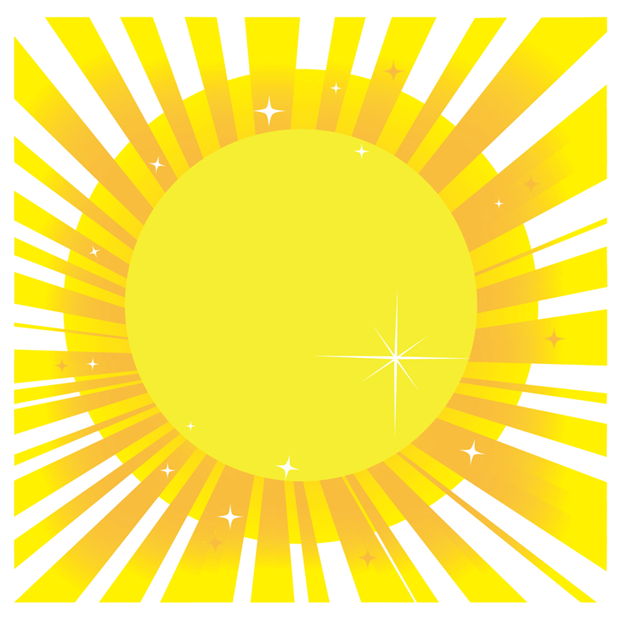 Enjoy the sunshine whenever you can! I always shutter when I hear of moth damage in wool - no I don't want a mouse in my house or in my wool, but to my mind, a moth is destructive in so many ways - and usually not discovered until the damage has been looonnng done. I know there are many ways of storing yarn and wool items - so far I have used plastic bags to deter moths and it has worked. (I have a great deal of yarn and it takes only one moth to cause damage.) I know some say that plastic bags are not good for long term storage of wool items. Not sure what else would work as well for a moth deterrent. Long ago I used moth balls but gave that up when I couldn't get the smell out of a sweater. How do you and your readers store wool? Wow, Elaine, you are so right that the damage a moth can do might go undetected for a very long time. That is a scarey thought. My Mom used to use moth balls, but I do not for the same reason as you. Most of my yarn is stored in plastic bags or boxes. There is also some in cardboard boxes and cloth knitting bags. This summer I saw one small white moth in my dinning room land on some new wool yarn that I was about to begin swatching. I put the moth outside and then online I read that if I put the yarn in a plastic bag in the freezer for 3 months, any moths and their eggs would be killed. I did so, even though that moth probably was only on the yarn for a couple of seconds. I inherited all of my dear aunt's sewing things. Among the odds and ends, I came across many of her handwritten notes. At the time, I nearly tossed them out. The older, wiser, me, is so glad that I didn't. They bring me much happiness every time I hold and read one. She was a wonderful woman!